(by Ben Kamisar, The Hill) – President-elect Donald Trump met Tuesday with former football superstars Jim Brown and Ray Lewis to talk about curbing gang violence. Brown and Lewis praised the president-elect after the meeting at Trump Tower. They said they primarily spoke to Trump about Brown’s Amer-I-Can non-profit, which aims to keep kids away from gang violence. Former “Apprentice” star Omarosa Manigault and Cleveland Pastor Darrell Scott, two of Trump’s most prominent black supporters, sat in on the meeting. Pastor Scott told reporters that the president-elect gave a “verbal commitment” to merge Brown’s program with the Trump administration. Throughout the campaign’s closing stretch, Trump made direct appeals to the black community, promising that he would help make their communities safer as president. Brown and Lewis were superstars in the NFL and both won the MVP award and the league championship. Lewis, who played for the Baltimore Ravens, told reporters that Trump is committed to “helping us change what hasn’t been changed.” He praised the Amer-I-Can program and said he supports Trump’s pick to lead the Department of Housing and Urban Development, retired neurosurgeon Ben Carson, who also ran in the Republican presidential primary. “What we believe, with the Trump administration, is if we can combine these two powers of coming together, forget black and white. Black or white is irrelevant,” Lewis said. 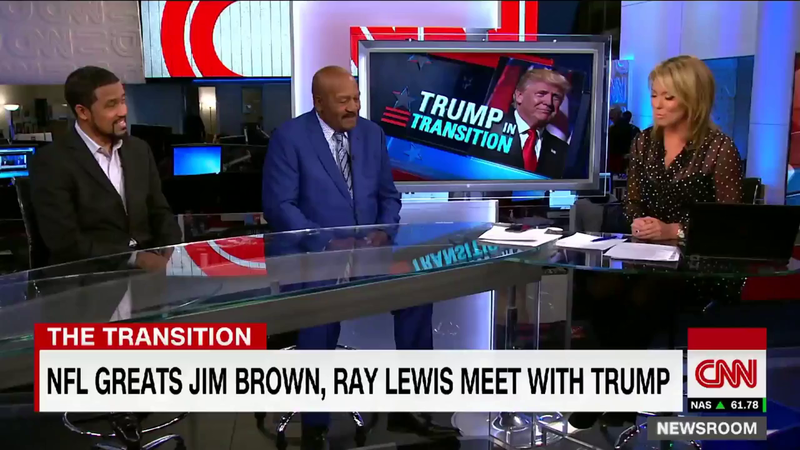 Interviewed by CNN’s Anderson Cooper Tuesday night, Mr. Brown said that Trump was “very receptive” and lighthearted as they discussed those issues. Brown acknowledged he was a Hillary Clinton supporter, but said that “people that go against the election are going against America.” He heralded America’s free and fair elections and said it would have been too easy for him to sit back and complain after his candidate lost. 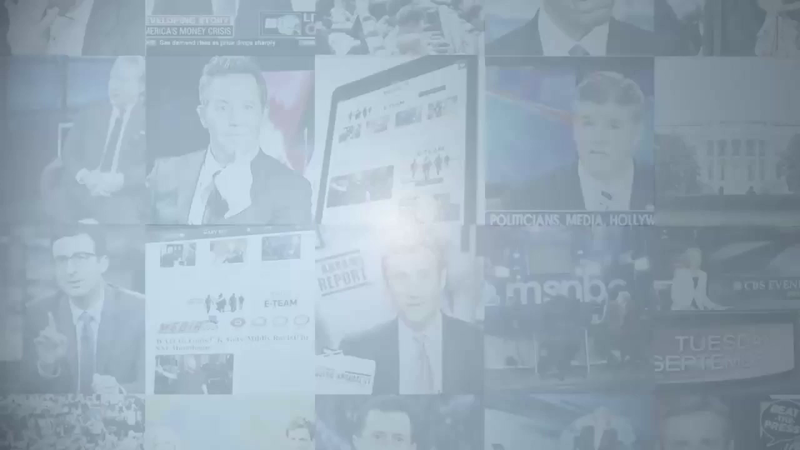 Compiled from news reports by The Hill and the NY Daily News. Reprinted here for educational purposes only. May not be reproduced on other websites without permission. 1. Who are Jim Brown and Ray Lewis? 2. What is the purpose of Jim Brown’s Amer-I-Can organization? 3. What promise did Donald Trump make to the black community during his campaign? 4. What commitment has Mr. Trump made, according to Pastor Scott and Ray Lewis? 5. How did Mr. Brown explain his positive feeling about President-elect Trump, after he voted for Hillary Clinton? What is your reaction to Mr. Brown’s answers and assertions about his meeting with Donald Trump? (inspired, encouraged, dismayed…) Explain your answer. 7. 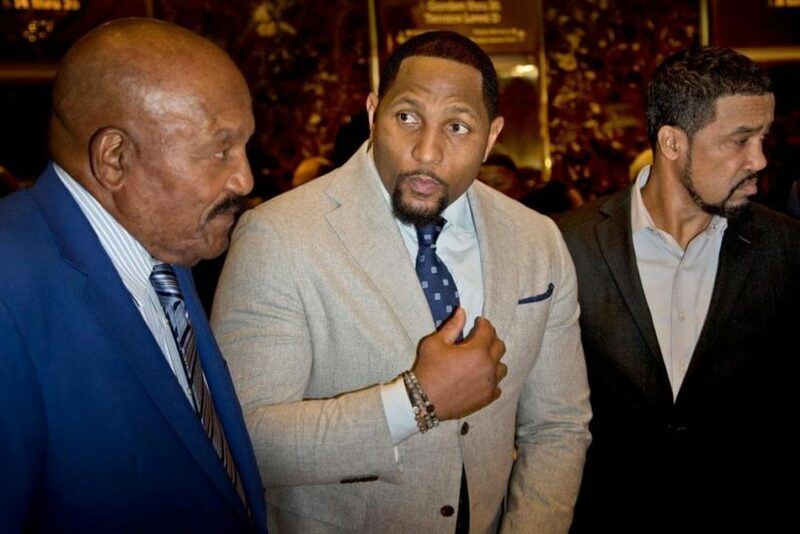 NFL stars Jim Brown and Ray Lewis are enthusiastic about the potential for improving Black communities by working together with a President Trump. After listening to the interviews, do you share their enthusiasm? Explain your answer. Jim Brown (born February 17, 1936) is a former professional American football player and actor. He was a fullback for the Cleveland Browns of the National Football League (NFL) from 1957 through 1965. Frequently regarded among the greatest football players of all time, Brown was a Pro Bowl invitee every season he was in the league, was recognized as the NFL Most Valuable Player four times, and won an NFL championship with the Browns in 1964. He led the league in rushing yards in eight out of his nine seasons, and by the time he retired had shattered most major rushing records. In 2002, he was named by The Sporting News as the greatest professional football player ever. Ray Lewis Jr. (born May 15, 1975) is a former American football linebacker who played his entire 17-year career for the Baltimore Ravens (1996-2012). Playing middle linebacker his entire career, Lewis is considered one of the greatest ever to play the position. Lewis is one of the few players in NFL history to play in a Pro Bowl in three different decades (1990s, 2000s, 2010s). He is also thought to be the greatest Baltimore Ravens player of all time. He won the NFL Defensive Player of the Year in 2000 and 2003, becoming the sixth player to win the award multiple times. Visit Jim Brown’s Amer-I-Can website.